Nintendo has debuted a trailer for the upcoming Mario Tennis Aces DLC character Kamek, who will be available in-game this May. Mario Tennis Aces is about to add another character to its roster with the addition of Kamek. 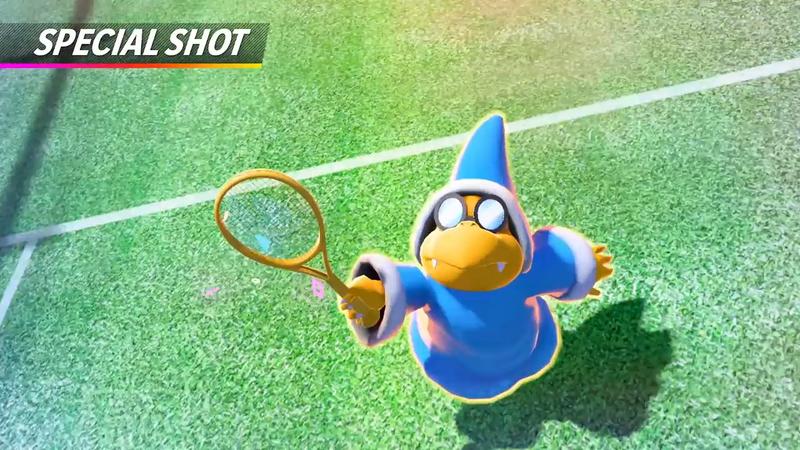 Nintendo released a new trailer showcasing Kamek's moves ahead of the character's April debut in Mario Tennis Aces, and he looks just as annoying as he is when you're facing him as an enemy. Kamek is an old and powerful Magikoopa who acts as something of an advisor to Bowser, and Yoshi's total enemy. He's one of the most powerful antagonists in Mario games that you see over and over, and takes care of Baby Bowser. Those interested in getting early access to Kamek can participate in an online tournament between April 1 at 9:00 JST and May 1 at 9:00 JST and they'll be awarded with the character. Everyone else can expect Kamek without having to play in the tournament beginning on May 1. Kamek will be joining a wide variety of characters previously added to the game, including Pauline, Luma, Dry Bones, Boom-Boom, and Piranha Plant. The game's become a veritable who's who of Mario games, for sure. "Mario Tennis Aces has provided me with some of the most fun I've had in a Mario game in quite some time. Through it all, even the most frustrating parts of it, I was compelled to keep playing, no matter what. It's addictive, just like the other iterations that came before it, in the best way." If you're looking for a fun, arcade-centric tennis game with all your favorite Mario characters, definitely give it a look. And then be sure to grab Kamek early if you're keen on adding him to your game. Is this a good game? I never hear anyone talk about it but I remember previous titles being a hoot.